In the past 20 years, the MENA region has seen a growth in the creation of new universities. Universities are at the core of some of the most recognised economic innovation ecosystems of our age. Though traditionally regarded as conservative, today’s elite institutions are at the epicentre of Silicon Valley, Route 128 and Cambridgeshire, to name a few. Their influence has often been unplanned and unpredicted, including the creation of five of the world’s most valuable public companies by dropouts. Can planning make this process more efficient? The technologies of the Fourth Industrial Revolution are disrupting the industries of almost every country, heralding the transformation of entire systems of production, management, governance and employment. The world is once again witnessing a technological epoch that will affect all of our futures. Some nations are more prepared than others for this disruption. Prudent countries, including many MENA nations, are responding with farsighted programmes of national transformation. Take Oman 2040, for example, which sets out one of the Sultanate’s national priorities as “inclusive education, lifelong learning, and scientific research that lead to a knowledge society and competitive national talents”. The United Arab Emirates Centennial 2071 vision is another such example, with its not insignificant goal of making the UAE the best country in the world through education and a focus on advanced technology and engineering. Saudi Arabia’s Vision 2030 is truly transformational in both its ambition and its scope. One of its three key themes is titled An Ambitious Nation—central to which are the visionary schemes of NEOM, a mega-city for the future, and the Red Sea Development Company, the spearhead of Saudi’s new tourism strategy. The sheer scale and breadth of these projects literally demand that new innovations and technologies are central to their realisation. In the past 20 years, the MENA region has seen a growth in the creation of new universities—from Kuwait’s Gulf University for Science and Technology in 2002 and my own institution, King Abdullah University of Science and Technology (KAUST) in 2009, through to Qatar’s Hamad Bin Khalifa University (2010) and Oman’s National University of Science and Technology, which opened in September 2018. 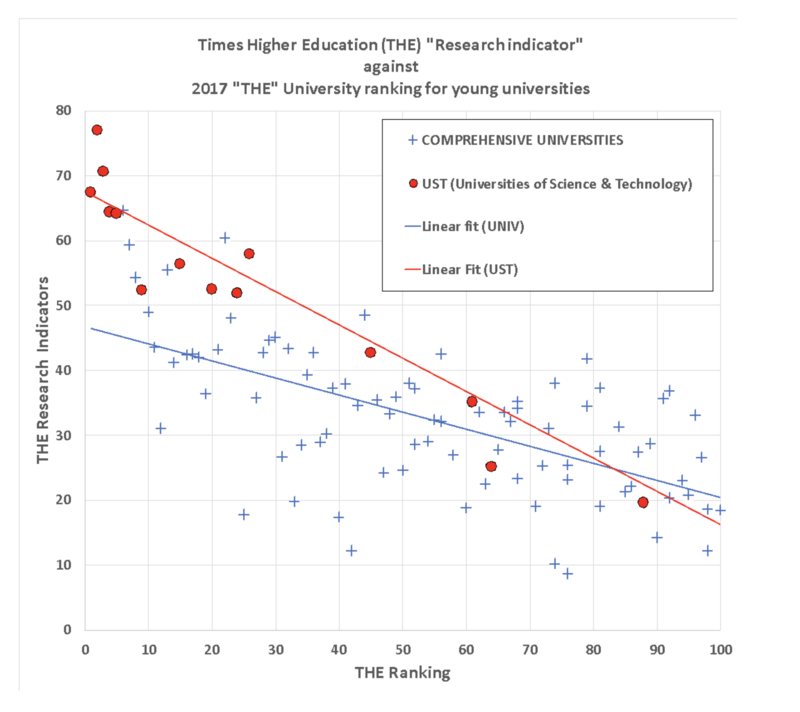 Globally, these universities of science and technology (USTs) are performing better than traditional universities due to their unique blend of high-quality research and intensive focus on innovation, as the below graph demonstrates. In some cases, when funding these new institutions, the leadership in each country may have done so with an eye to their country’s national transformation programmes. In the context of these plans, universities become uniquely suitable delivery mechanisms – silver bullets that will bring about these ambitious national transformations and do so through their natural focus on collaboration, partnerships and synergy between pioneers of science and technology and industry. However, are these innately conservative institutions correctly positioned to fulfill this 21st century role? The world's next great tech hub? My answer would be a qualified ‘yes’. USTs in the MENA region are ideally placed, temperamentally and geographically, to take up this challenge. They have the potential to create the world’s next great tech hub—geographically halfway between Silicon Valley and Shenzhen. They are young institutions—agile, dynamic and outward-facing, and unburdened by dated conventions. And they are at the forefront of the research that drives the Fourth Industrial Revolution. KAUST, for instance, was created for the pursuit and advancement of scientific knowledge and its broad dissemination and benevolent application in four national and global strategic areas: food, water, energy and the environment. Additionally, KAUST has incorporated computational simulation and modeling into its DNA, to optimise important processes that will aid progress in the aforementioned areas. As such, KAUST has brought into service two supercomputers ranked in the top-15 most powerful worldwide and, until 2018, was the only university in the world operating such machines for the benefit of its own researchers and their direct collaborators. Computer science is the primary area of research for an unprecedented 46% of KAUST's globally recruited faculty. Going forward, KAUST will develop new initiatives in AI and machine learning, for application to the same portfolio of scientific discovery and engineering design. And like the best USTs, we have created an environment conducive to hosting research centers of multinational corporations. In fact, SABIC, Dow, and Saudi Aramco already have a physical presence on our campus’ purpose-built research and technology park. In total, we have 55 industry partnerships with 26 partners and from this, we are seeing the beginnings of an industrial research ecosystem that can be scalable for national economic goals. Moreover, if we think as a region and as a potential collective of pioneering universities, the USTs of this region can be a truly global science and tech ecosystem and a global hub between East and West. At their core, USTs are also incubators for entrepreneurship. And those of us based in the MENA region can ensure that our start-ups can target underserved regional needs, while also catalysing internationalism across the region. This requires support, both in terms of money and mentorship. KAUST makes venture capital investments in high-tech start-ups from seed (less than $200,000) to early-stage (up to $2 million) and becomes a long-term strategic partner of these ventures. This approach has already borne considerable fruit. Our start-up successes include MEDAD Technologies, which has invented a solar-powered seawater desalination process that generates cheap, low-energy, potable water. FalconViz is a Saudi registered company focused on 3D surveying and mapping by unmanned aerial systems (UAS) with autonomous integration of planes, helicopters and 3D software solutions. Iyris Technology is a spinout working on smart solar windows that can turn incoming sunlight into electricity. Why only a qualified 'yes'? The fact is, USTs face a number of challenges. Firstly, they need to be able to adapt constantly. This was easy to begin with. They were founded as influencers for change, but as they mature, they run the risk of being left behind. Never is this truer than in the Middle East, where the pace and breadth of reform is quite breathtaking. Therefore, universities must ingrain agility into their organisational culture if they are to remain responsive to national transformations. There is also the issue of institutional autonomy versus stakeholder accountability. While KAUST has financial independence, thanks to its endowment, this does not mean we are above scrutiny. USTs such as KAUST must prove their value constantly and demonstrate their return on investment to stakeholders who are ever more concerned with impact. In this context, the intrinsic value of basic research must be justified too as it has always been critical to the innovations that ultimately drive economic transformations. In turn, institutional leaders need to navigate and balance multiple conflicting concerns, such as: short-term economics vs long-term academic vision; institutional autonomy vs. stakeholder accountability; local vs. global agendas, academic ideals vs. political/societal realities, and short vs. long-term horizons. Therefore, positioning universities and especially USTs in the face of national transformational plans requires some transformation of the traditional idea of the university. They must be much more outward-facing and connected than the 20th century organisational model. They will need to be proactive and become risk-takers, as that is also a key ingredient to innovation. Their governance and operational structures will need to be both more resilient and flexible, as these will be the foundations upon which risk, creativity and - ultimately - transformational innovation can emerge. Most of all, these 21st century universities will need to be open to adaption and resist the institutional urge to adopt rigid conventions. In short, the most successful universities will become transformational in character. To do so, I believe that universities will need to open up and engage with society and its shareholders more. Beyond universities, the more successful nations are likely to be those that can create an ecosystem where USTs can thrive academically while delivering on national transformation priorities. That is why countries like Saudi Arabia, and others in the region, are setting the pace and showing how universities can truly be positioned as part of national transformational change. Due to technological innovations, evolving population demographics, sustainability priorities, and other perhaps unforeseen influences, the next decade may deliver a world only barely recognizable today. In this scenario, the importance of research universities to their host societies and economies can greatly increase, provided they learn to communicate better and societies understand and preserve their universities’ complementary roles. USTs are not just helping to transform economies and societies; they are also transforming the very idea of universities and the place of the academy in the 21st century.